What is a dental inlay? And how much do dental inlays cost? When is a dental inlay the best choice? How much do dental inlays cost? A dental inlay is a type of dental filling which either complements or fills damaged parts of the teeth. The difference between dental inlays and other types of dental fillings is that dental inlays are manufactured for and adjusted to the individual tooth. Dental inlays are the solution when the tooth isn’t so damaged to require a dental implant. Also, the application of a dental inlay improves the aesthetics of the teeth because it covers up even the smallest defects. Which materials are used for dental inlays? Dental inlays are made of several materials: ceramics, gold, galvanic, titanium and synthetic materials . Evidently if aesthetics is the main requirement, a ceramics dental inlay is the most appropriate solution. 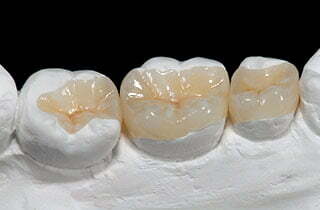 Experience shows that most patients prefer ceramic dental inlays. Another type is the galvanic dental inlay, which is a combination of gold and ceramics. Nowadays dental inlays made of titanium or a certain synthetic materials are manufactured and applied more and more often. These are made of high-graded plastics and are also called composite inlays. Using a dental inlay you can prevent or avoid the application of a crown or even of a dental implant. Dental inlays are also more cost-efficient since their costs are lower than the costs of a crown or of a dental implant. The dental inlay costs depend on the materials in use, on the costs of the dentist, and those of the dental laboratory. Usually with dental treatments in Hungary, one can save more money. For example ceramics dental inlays cost approximately 200 £ per unit.